I have mentioned before how much I love Twitter. It has given me the opportunity to meet so many interesting, fun, smart people and made many new friends. Today, I am honored to share a guest post with one of those friends, Deanna Morauski who besides having some amazing cooking skills, will be featured on the Live Well Network this month! (see show details below). Who can say no to a gorgeous jelly-filled doughnut? It's not only a perfect treat but it is a work of art – art you get to eat. Simply perfect. Dissolve yeast and sugar into warm water and give a quick stir. Cover witha clean towel and allow to sit for about 20 minutes or until foamy. This will give yeast batter a good start. Whisk in milk, eggs butter and salt until well-mixed. Slowly stir in flour one cup at a time until dough becomes medium-firm. Kneed until dough becomes smooth and elastic. Only add flour as needed during this process the dough should be able to be formed into a ball easily. Cover and allow to sit in a warm place again for about an hour or until dough ball has doubled in size. Remove towel and when dough has doubled in size, punch it down. Let it rise again for about an hour in a warm lace covered by the towel again. (or covered with saran wrap in the fridge overnight). After dough has doubled in size again, use about 1/2 cup of dough at a time to form into balls. Flatten the dough balls a bit and place on a baking sheet coated with non-stick spray. Allow to sit for about an hour in a warm place until doubled in size for one last rise. During last half hour of waiting for dough balls to rise, place shortening in deep fryer and turn on to 350F to preheat. After dough balls have doubled in size, place two at a time into deep fryer to cook. Fry the first side for about 3-4 minutes until deep golden brown then flip to cook other side until it is also a deep golden brown (about 3 more minutes). Place cooked doughnuts onto a baking sheet that has been lined with a few layers of paper towels. Allow to cool. Using a pastry bag and a pointed decorating or pastry tip, squirt the jelly of your choice into each doughnut. 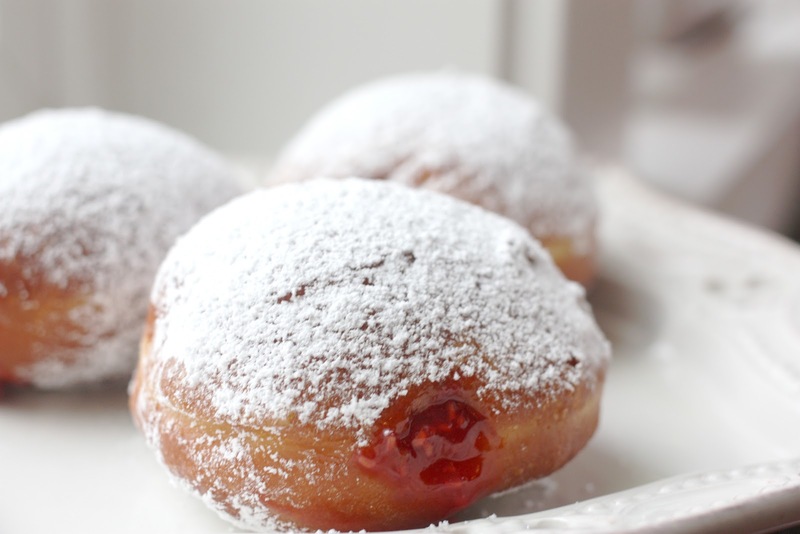 Use a sifter to sprinkle bottom side of each doughnut and then the tops with generous amounts of powdered sugar. 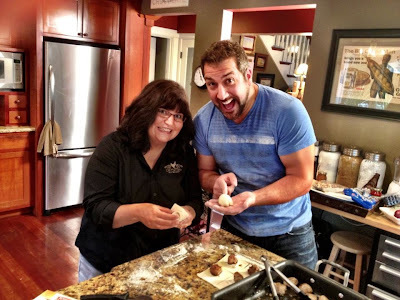 You can see Deanna on Joey Fatone's new show "My Family Recipe Rocks" on the Live Well Network this month on October 27th. She will be making four scrumptious recipes throughout an entire episode filmed at her B&B, The Old Hen. Follow along on her Facebook page or on Twitter for updates . Deanna’s love for baking and cooking began as she sat upon a baker’s stool as a little girl. Her love for people grew in the midst of church potlucks. She expresses her loves today creatively through speaking, writing for her foodie blog, television appearances as well as hosting guests, including celebrities, at her award-winning inn, The Old Hen Bed & Breakfast in Snoqualmie Valley, Washington.